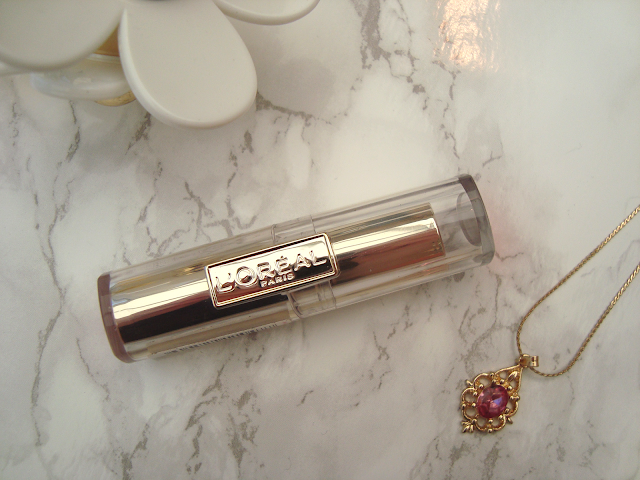 I recently bought two L'oreal Paris Rouge Caresse Lipstick from Boots and I have used both of them a hell of a lot since purchasing. The first one I'm going to review is in the shade Dating Coral. 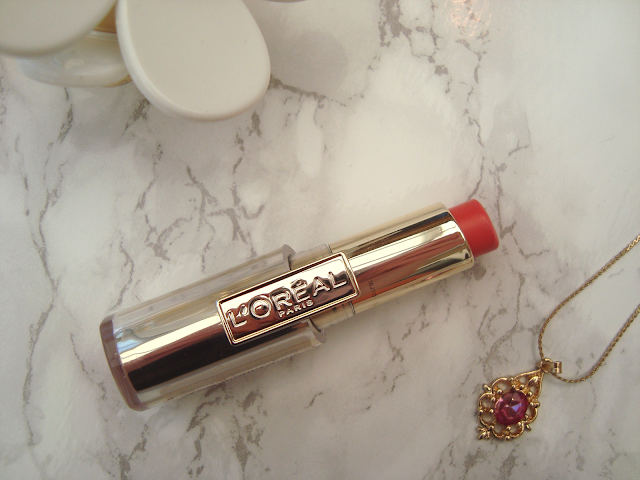 Dating Coral is a gorgeous warm coral with a hint of red. I think it's the kind of colour that would look great in summer and in winter. If we were to talk about if it were blue based or yellow based, I would say it was yellow based as it seems warmer rather than cooler and it doesn't make my teeth look any whiter. The packaging of these lipsticks is ultra slick, they look a lot more expensive than they actually are. The only problem I have with the packaging is how you open it. It's really hard to get the lid off. You have to push the L'oreal logo up and the lid comes off but the first time I used these I was fiddling around with it for about 10 minutes before having to ask someone if they could get the lid off for me. A good thing about this is that at least the lid won't fall off in your make-up bag! The consistency of the L'oreal Rouge Caresse Lipsticks are that of the Revlon Lip Butters, they apply incredibly easily and they are very pigmented so you only need one quick swipe and you are ready to go, perfect if you're in a hurry. Dating Coral does happen to show up a little bit of dry areas on your lips so you may want to apply a balm beforehand just to cover any problem areas. 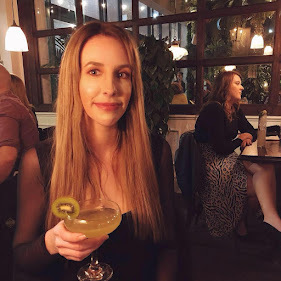 I have had lots of people asking me on here and on tumblr about the results from the new L'oreal Paris Preference Wild Ombres hair dye that I recently bought to dip-dye my hair with so here is a little update and how I found it.! At 7pm on Thursday evening I finally decided to give it a go. Now, as my hair originally was brown all over the head with blonde underneath, I stood in my bathroom for 45 minutes trying to separate my brown hair from my blonde. In the end I realised how ridiculous I was being, untied the hair ties, mixed together the powders and the mixtures together, separated all of my hair in two sections down the middle and I was ready to start. It comes with a brush in which they want you to pour some dye on the brush then brush through the ends of the hair to ensure the hair is completely covered. I started doing this for half an hour on one side of my hair (whilst trying to avoid the already blonde bits) before finding it a little tiresome so I ended up pouring the dye into my hands and slapping it on my hair, then brushing it through. First I put the dye all over my hair up to my chin (where they suggest you ombre up to) before putting a lot more on the ends so I get a gradual effect and so the hair is blonder at the ends. I then repeated for the other side of my hair (before realising once all the dye was finished that I had missed a huge chunk) and left it for 45 minutes. The instructions suggest you leave it from 25-45 minutes or until the hair underneath the dye has gone blonde. The results? I love it. I love my hair so much I'm annoyed they haven't bought this out sooner. It's so easy to use, the instructions are so straight forward and I would literally recommend this to anyone. I didn't do it very neat - actually it looks quite messy but who wants a neat dip-dye? The best part about this? It cost me £5 when it was on offer. £5! Think about how much that would have cost in a hair salon. When I come home from my holiday I may do it again to get it even lighter but for now, I like my blonde ombre hair! A while ago I remember hearing somewhere that L'oreal were bringing out an at home dip-dye kit. I could have jumped with joy when I heard this as I have been wanting to get my hair dip-dyed (or ombre'd if you like) for what feels like forever. In January I finally plucked up the courage to get my blonde locks dip-dyed and gave my hairdresser a bunch of photos of dip-dyed hair, sat back in the chair and awaited my hair to look so much more fashionable that I'd step outside my front door and instantly get asked what I did to achieve my very lovely ombre hair. Sadly that didn't happen. My hairdresser got a little confused, dyed half of my hair brown and left my old blonde hair underneath. It took me a good few hours to pluck up the courage to look in a mirror. And I was not happy. 8 months later and the blonde is finally growing out. At the moment the blonde is half way down my hair so I am finally getting the ombre look that I so desired but as the blonde is underneath, you can't really see it. Thankfully the other day I was scrolling through Instagram when I saw someone had posted a photo of the L'oreal Preference Wild Ombre dye that has finally been released after much anticipation from me. There are three shades to choose from. No.1 - Light Brown to Dark Brown. No.2 - Dark Blonde to Medium Brown. 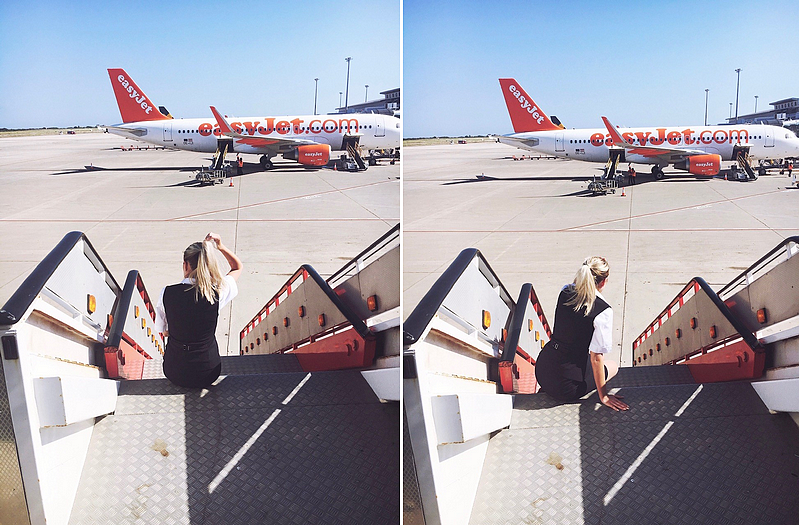 No.3 - Blonde to Dark Blonde. I did get a little confused as to which colour to buy as when I was younger I was incredibly blonde but then my hair started getting a bit darker so I dyed it blonde again, then I got it dyed dark brown when the above fiasco happened. I dyed it dark brown in January and I haven't had to re-dye my roots as they haven't appeared so I bought the shade No.3. This is such an exciting new hair dye for those who have wanted to get their hair dip-dyed without wanting to spend £60+ at a salon. I can't wait to use this product and you will all find out how I got on! I don't know about you but ever since studs and embellished clothing has become 'in' recently, I can't seem to get enough of it. 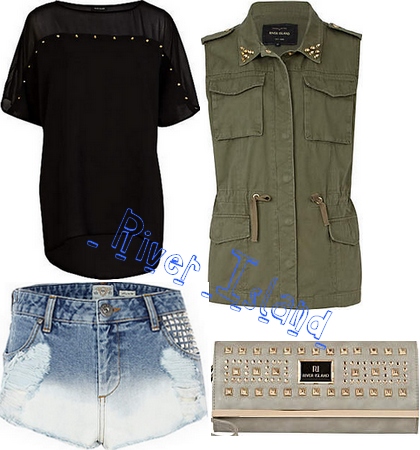 If I see a studded collared shirt in a shop I'm there like a moth to a flame. I'm also slowly making my way into buying clothing that have been embellished with crystals, beads, glitzy stones etc however I am cautious with that one as I haven't worn purple stones on my clothing since I bought flared jeans with butterfly stitching at the knees when I was 7 and to be honest, I wouldn't want to make that same mistake again. I know wearing clothes with studs and crystals on can be a bit 'argh!' 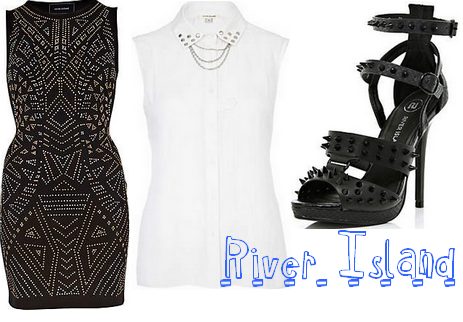 especially as we don't want to look like we got turned away from My Big Fat Gypsy Wedding so I'm going to show you what some of our favourite online stores have to offer us with their studded and embellished clothing and luckily there is no butterfly stitching and crystallised antenna in sight! You may have read my last post on L'oreal where I mentioned that I spent over £15 on L'oreal products and I got a little cute gift box of goodies for free (you can read this post here). Today I'm reviewing one of the products from the gift box and you'll be pleasantly surprised. The first product I'm reviewing from the little gift box is L'oreal's Super Liner Luminizer Eyeliner which states is for Brown eyes. These eyeliners come in three different versions which are supposed to enhance three different eye shades - Blue, Hazel and Green. I received the eyeliner most suited for Brown eyes, which I do not have although nothing untoward happened when I used the eyeliner which wasn't meant for me. The website states that all of these eyeliners are an off black colour which has light reflecting particles throughout it and the statement is completely true. When swatched you can see the eyeliner is an almost black liquid with little blue and silver particles in which help to enhance your eye colour. Onto the eyeliner itself. 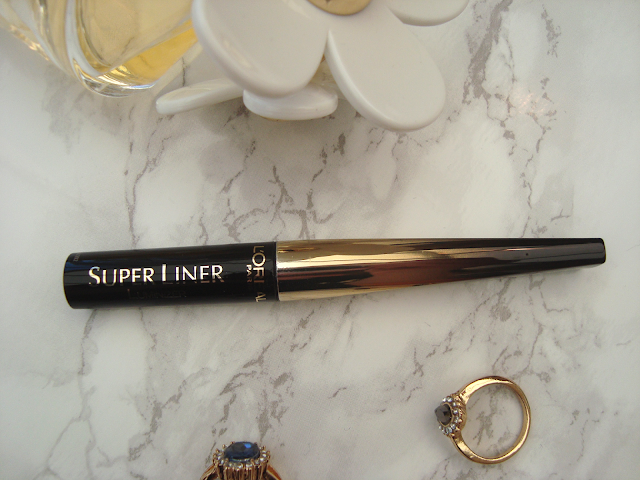 Unlike my beloved L'oreal Super Liner Perfect Slim Eyeliner (review here) this eyeliner has a different type of nib to it. Super Slim has a really thin nib which is perfect for getting a precise thin neat line on your eyelid whereas this nib starts off relatively thin but then gets thicker, meaning you could use the tip to get a thin, precise line (you'd need a steady hand to do so!) or you can slant the pen so you can get a thick line. The only problem to this is I start off using it wanting just a subtle line of eyeliner on my eyelids but end up with great big lines all the way round my eyes. I was really impressed with the results. Unlike Super Slim, this eyeliner doesn't transfer onto the top of the eyelid which isn't the end of the earth but it is a little annoying when you go out in public without checking the state of your eyelids. 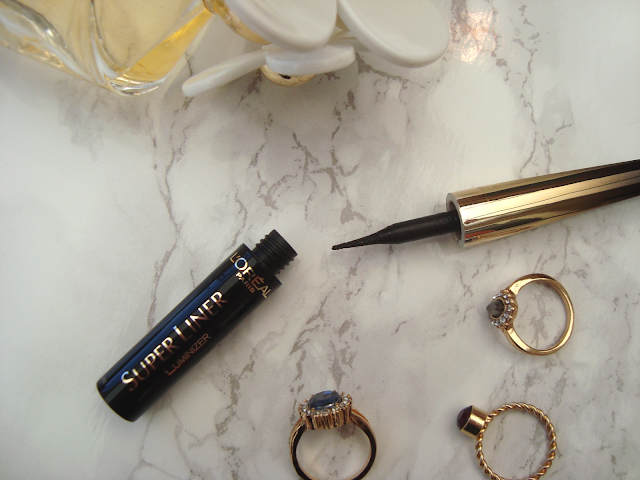 The L'oreal Super Liner Luminizer Eyeliner is easy to apply, dries fairly quickly and lasts literally all day. I went out last week and applied this eyeliner at 8AM and at 11PM it was still in the exact same position in which I applied it. Perfect! However, all the best things in life have a few little niggles. When I dip the pen into the base to pick up some more eyeliner, apply it, put it back in the base to get some more eyeliner nothing really comes out. When you try and use it again the eyeliner comes out very very lightly and appears a very dull black therefore you have to put the lid back on and shake it and it works properly again. Nothing too major but I find I have to put the lid back on and shake it quite a few times before my eyes are completely lined. The Eyeliner also feels a little wet on the eyelids but as long as it doesn't transfer then I have no complaints. 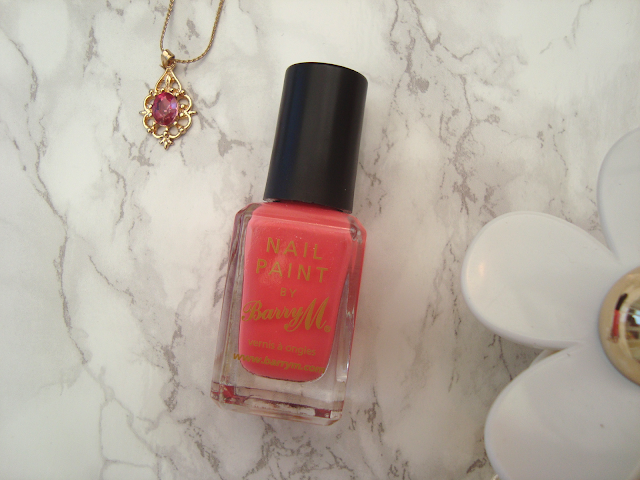 A few weeks ago I bought the Barry M Nail Paint in Pink Flamingo from Boots. Pink Flamingo is one of the shades I've been meaning to buy for a while now and I'm so glad I finally got round to purchasing it. Pink Flamingo is a gorgeous pinky coral creme nail varnish. It took me 2/3 coats to get fully opaque coloured nails however it did seem to take forever to dry. So much so that I smudged my right hand 3 times before I managed to sit still long enough for it to dry. In terms of wear I did apply Seche Vite's Top Coat on top and found that my nails lasted well over a week before chipping which is a huge accomplishment. I don't know if this is down to Seche Vite or Barry M but I do find Seche Vite to be a big hit and miss on my nails. I hadn't ever heard of the brand Nasty Gal before, the first time I heard of it was when I saw an advert for it when I was on a website cheating at scrabble browsing the internet recently. I immediately clicked the advert and was led to their website where I fell in love with EVERYTHING. If I had an unlimited amount of money then I would buy one of everything. 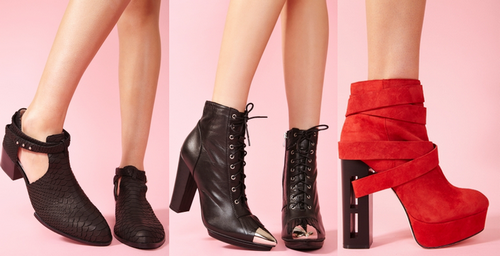 If you, like me, had never heard of them then Nasty Gal is an online fashion brand based in the US. 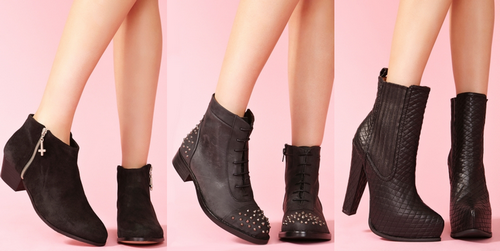 Nasty Gal have an amazing range of statement shoes. Some that I would wear, some that would look great in my wardrobe and some that I would want displaying on a shelf in my bedroom as they're so eye-catching. I could go on but you'll have to see for yourself by clicking here. It is also worth noting that you have to pay roughly around £9.50 to get your items shipped to the UK. A while ago I spent over £10 or so in an Avon brochure so I received a little box of goodies for free. I received a lipstick, an eyeshadow quad, some nail varnish and a mascara, which is Avon's Super Full Mascara. It took me a while to start using it as I had a few mascaras already on the go and as soon as I started using this mascara I was annoyed with myself that I hadn't done so earlier. The mascara wand itself is that of a plastic comb wand which helps to separate lashes and adds more length. I've used a mascara with a wand like this before and I really liked it so I was pleased to see this type of wand again, especially as last time I got a few compliments on my eyelashes, though it hasn't happened since! Ha. As soon as I applied one coating of mascara onto my eyelashes I literally fell in love with it. I don't like my eyelashes looking too false as I like my eyes to look fairly natural so for me this is the perfect mascara. The Avon Super Full Mascara makes my eyelashes look much longer and fuller than before, it doesn't clump which is perfect nor does it flake during the day. If you put too much on it can make your lashes look quite spidery but as I only ever apply one coat I don't usually get that problem. I can't recommend this mascara enough to those of you who like longer, natural looking lashes. If you're after a mascara that makes your eyelashes look appear fuller and thicker then perhaps this isn't the mascara for you. A while ago I was looking for some nail inspiration from Instagram when I saw someone had posted a photo of their nails like this but with a bee rather than a lady bird. I didn't want to copy it too much so I swapped the bee for a lady bird and this is how I did it. 1. I applied my base coat and my base colour, 17's Lasting Fix Nail Polish in Woo Me. 2. Once the above had dried I put a small, thin blob of 17's Lasting Fix Nail Polish in Caribbean Coral on my thumb, trying to be as careful as I could to make a ladybird shape. I managed to smudge it a little but hopefully it isn't too noticeable. 3. Once the coral red had dried I used my nail art pen with the dotting end and very carefully drew a circle round the body and drew on the ladybird details, such as the eyes and spots. 4. At this point my nail art pen exploded everywhere so after getting my mum to help clean me up, I used the dotting tool of my nail art pen and drew on little lines across my nails to look like a trail. You can use a top coat but I didn't want to risk dragging the nail art colour down so I chose not to use one.